Samsung’s Galaxy range extends a lot further than the S10 and Note 9. 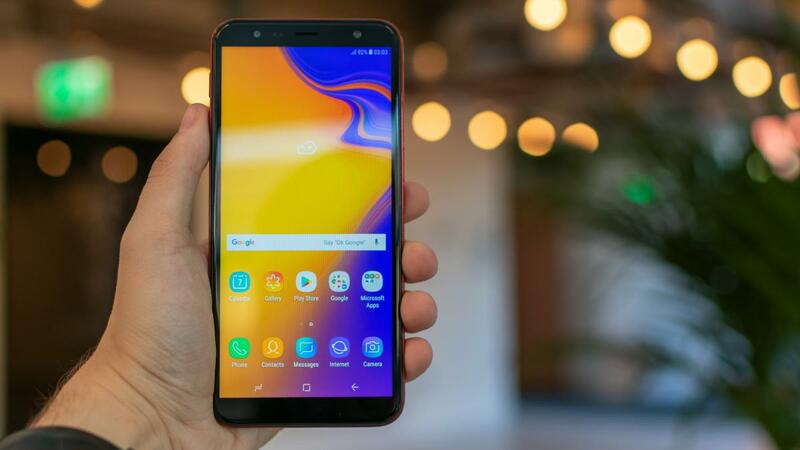 Though they don’t grab the headlines in quite the same way, the company offers plenty of cheaper smartphones, and the Galaxy J6 Plus squeezes the price all the way down to £190. It’s still recognisably a Galaxy phone, but numerous compromises have been made to get the price that low. The Galaxy J6 Plus represents a new leap for Samsung into the lower end of the phone price spectrum. 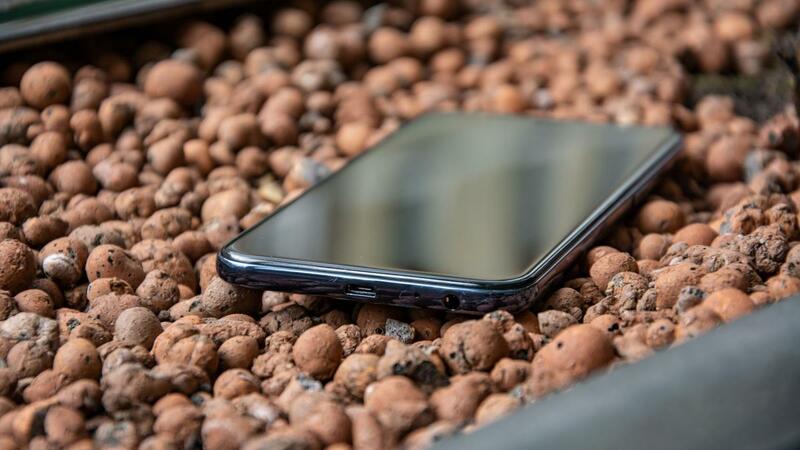 This isn’t an iPhone rival, nor something Huawei’s upcoming P30 Pro should be afraid of; it’s aimed at much lighter wallets. Thus, the J6 Plus is significantly cut down compared to pricier Galaxy phones. For one thing, the display isn’t OLED, and it has a relatively low 720p resolution. The internal specifications, meanwhile, include a lightweight Qualcomm Snapdragon 425 processor, 3GB of RAM and 32GB of internal storage. At £190, the J6 Plus undercuts huge swathes of the smartphone market. 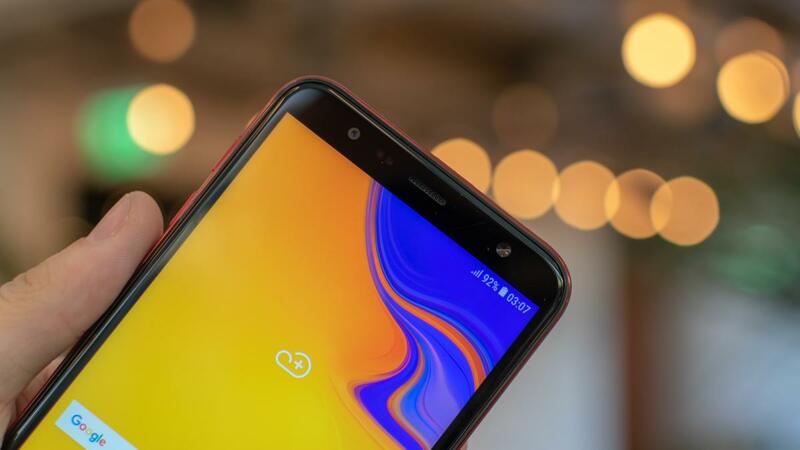 It still has rivals, though, notably the Motorola Moto G7 Power – our current bargain favourite, delivering unbeatable battery life and more generous internal specifications for a very similar price. The £200 Honor 10 Lite is another budget stunner, and Sony’s upcoming Xperia L3 looks like a winner too. The Galaxy J6 Plus is a bright and colourful phone – or it can be, if you pick the bright red version. There are also grey and black variants, if you find Samsung’s more traditional austere colouring more your speed. As I’ve mentioned, it also has a recognisable Galaxy shape, although beyond the first glance it’s quickly apparent that this isn’t a flagship handset. The fancy curved edges that have been a calling card of high-end Galaxy models for the past few years are nowhere to be seen: rather, the flat screen calls to mind the old Galaxy S6. The design is more modern than that, though. There’s no physical home button, and the fingerprint reader takes up a new residence on the side of the phone. I’ve seen this before with Sony devices, and it’s a very comfortable way to unlock the phone – as long as you’re holding it in your hand. If the phone’s lying on a table, it’s more of a faff than it has to be. That’s not my only quibble with the design. The phone lacks any officially-rated dust or waterproofing, although that’s pretty much to be expected at this price. And Samsung has also, inexplicably, decided to provide an old-style micro-USB charging port on the bottom of the phone, rather than using the newer USB Type-C standard. This means you can’t benefit from superfast charging speeds, nor the latest accessories. This screen on the J6 Plus is far from Samsung’s best, but it’s not bad. Needless to say, you’re not getting the perfect inky blacks and infinite contrast of its expensive OLED panels, and with that 720p resolution stretched across six inches, it’s not the sharpest display either. Even so, it looks punchy and vibrant. Our ColorMunki display colorimeter revealed a really rather good contrast ratio of 1,109:1, and the phone’s screen is capable of a maximum luminance of 493cd/m2, which is bright enough to stop you from squinting at the screen in sunny conditions. Colour performance is less impressive. We recorded an sRGB coverage of 83% and an average Delta E of 2.64, reflecting a handful of colour inaccuracies, most notably with oversaturated red and green tones. Unfortunately, you don’t get a choice of display profiles, as you do with other Samsung phones, so there’s nothing you can do about this. The J6’s big screen is ideal for multitasking. It’s easy to activate the split-screen feature: tapping and holding the Recents button on the left side of the onscreen navigation bar shrinks your current application up to the top half of the screen. You can then select your second application from a list, and adjust how much space each one gets by dragging a slider. Unfortunately, to make the most of a phone’s multitasking potential, you need a powerful CPU running the show, and on this point, Samsung has somewhat failed to deliver. Rather than using one of its own Exynos chips, Samsung has opted to power the J6 Plus with Qualcomm’s ageing Snapdragon 425 chipset, dating back to 2016 and clocked at just 1.4GHz. This puts the Galaxy J6 Plus well behind the curve when it comes to performance: in the Geekbench 4 single- and multi-core CPU benchmarks, the Galaxy J6 Plus scored 664 and 1,814 respectively. That’s half the speed of the similarly priced Moto G7 Power, and on par with the Moto E5, which is only £120. What does that mean in practice? Navigating the menus and playing around with apps is smooth enough. But running two apps at once is likely to feel sluggish, and you’re also unlikely to be running the best-looking games at their top graphical level. The GFXBench Manhattan 3 onscreen test returned an average frame rate of only 6fps. The best thing about the J6 Plus’ hardware is its stamina. It managed to last 17hrs 50mins in our continuous video-playback test. That’s quite a bit better than most other smartphones on the market, and indicates that you shouldn’t have any issues with running out of juice while you’re in the office. The J6 Plus runs on Android Oreo, rather than the newer Pie, but it feels nice and clean, with Samsung’s software overlay looking very much like stock Android. It isn’t quite as slick as Google’s Pixel launcher, and some of the app icons look a bit child-like, but the experience feels responsive and snappy. One feature that Samsung seems particularly pleased with is the Dual Messenger option. This lets you add multiple accounts to your “favourite messenger apps”, so that your professional and personal life is kept apart. This isn’t quite as safe as keeping a separate work phone, mind, so don’t come crying to me if you accidentally send an aubergine emoji to your boss at 3am on a Sunday morning. The only thing that annoys me about the interface is the fact that you can’t remove Samsung’s own preinstalled applications. Even if you choose to use Google’s own apps, you’re stuck with Samsung’s not-so-good calendar, web browser and gallery applications taking up space on your phone as well. At the rear of the Galaxy J6 Plus, you’ll find a 13-megapixel camera, plus a separate five-megapixel depth sensor, which can be used for adding artistic bokeh effects to your shots. 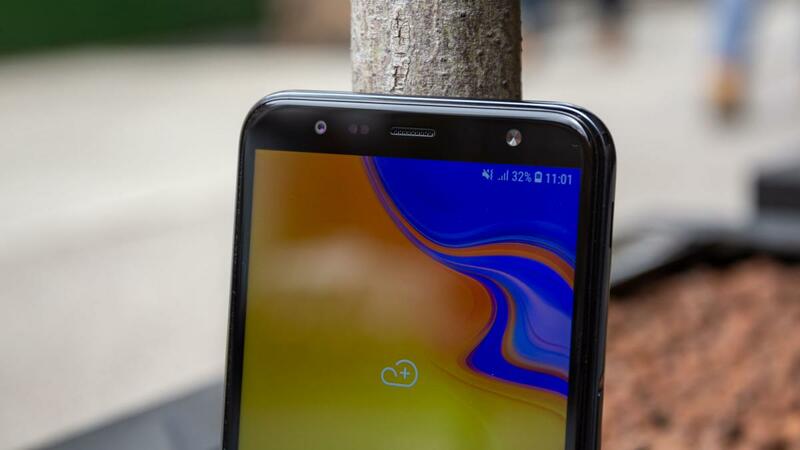 It’s impressive to see a dual-sensor array on a phone at this price: it wasn’t so long ago that such things were the preserve of handsets costing three times as much. And in good light, it does an excellent job. Pictures come out with plenty of detail, colour reproduction looks top-notch and the HDR mode effectively fills in shadowy areas. Even notoriously tricky objects such as tree foliage, building brickwork and wispy cloud layers are captured well enough. I like the phone’s “live focus” camera setting too, which allows you to use an onscreen slider to adjust the degree of background blur before capturing your image. It’s easy and intuitive to use, and the results look great. As the light dims, however, the J6 Plus struggles, with noise and compression artefacts marring our low-light test scene. You can’t expect perfection from any phone in this price bracket, but the £240 Moto G7 produced visibly cleaner photos of the same scene, with more detail. Likewise, the Galaxy J6 Plus does a perfectly satisfactory job of capturing Full HD video at 30fps – but the slightly pricier Moto G7 outclasses it with 1080p video at up to 60fps, and 4K at 30fps. The Galaxy J6 Plus makes a good first impression, but after using it for a while I’m a tad disappointed. It’s far from awful: the screen is pretty decent, the camera takes some nice shots and there’s enough power here to run Android smoothly, as long as you keep your expectations realistic. But Samsung’s J-series phones were once hailed as the budget phone kings, and this handset simply isn’t strong enough to inherit that crown. 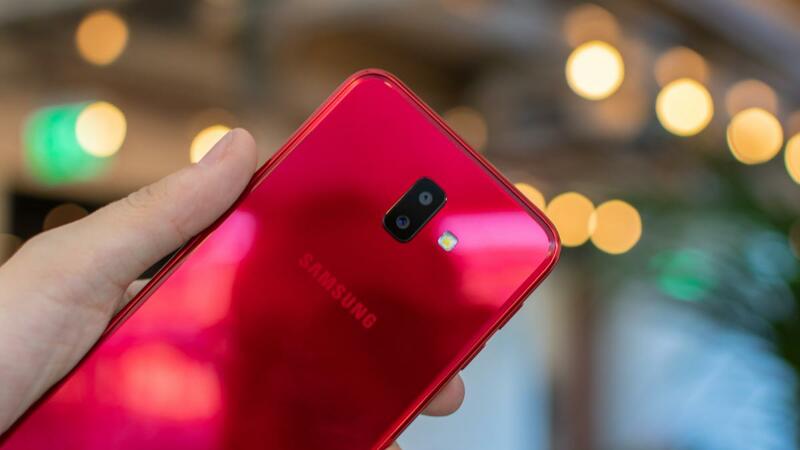 Rivals such as Xiaomi, Honor and Motorola have shown it’s possible to create a truly desirable phone on the cheap; here it just feels as if Samsung has failed to find the magic ingredient, resulting in a phone that’s not awful for the price, but not an irresistible bargain either.